Customize your visitor chat window to enable options like pre-chat form, file upload, chat rating, ticket form, and more. Easily tailor the look and feel of the visitor chat window by adding your company logo and branding. This requires no coding skills. You are now ready to install Chat on your website. Simply copy and paste the ProProfs Live Chat code on your website to start capturing leads. Once the code is in place, click on “Launch Chat” from the Dashboard to start chatting with your website visitors. ProProfs Chat is the easiest and fastest way to engage and convert website visitors to customers. Resolve customer issues faster by seeing what customers type (even before they send it) or what they are viewing on your website. Add ProProfs live chat software to your website to offer quality responses using ready-made templates & greetings, as effective customer service is an integral part of business success. The tool allows operators to consult supervisors during a live chat session to provide prompt and intelligent responses to customers. Adding online chat software on your websites is easy. Simply copy and paste your ProProfs Chat code on a webpage and start chatting with customers in minutes. The live chat software works on any web browser or operating software. Support operators can start a chat by simply logging into ProProfs Chat or via our desktops and mobile apps. Installing a live help chat software on your website helps you monitor and initiate conversations with site visitors, generate new leads with a pre-chat form and improve conversions. Your support operators can send proactive chat invitations to site visitors when they land on key pages of your site and gently guide them through the sales funnel which will improve the customer engagement considerably. Your support operators can start chatting with customers by simply logging into their ProProfs Chat dashboard. Operators can also connect with customers on any device using our native apps for desktops, Windows, Mac, iPhones, iPads and Android devices. You never lose a customer as even offline messages are recorded as chat history. You can easily brand and customize chat windows using custom logos, colors, fonts and graphics. You can also customize chat windows for each department, separately, for instance, Sales can have a catchy design while Technical Support can have a more professional-looking one. If you don’t want to create your own, you can also choose from an extensive gallery of beautifully designed templates that install at a click. With ProProfs Chat, you can monitor website visitors in real-time to learn where they are coming from, who they are and which pages are they viewing. This website chat software also integrates with Google Analytic, making it easy for you to centrally track visitors and your PPC campaigns. Access in-depth reports such as chat requests, operator login hours, chat ratings, chat transcripts and more which help you track operator performance. View post-chat surveys to gauge how happy customers were while interacting with support operators. You can also monitor "in-progress” live help chat sessions to assess the interaction of operators with customers in real-time. Improve your customer experience using ProProfs Knowledge Base and ProProfs Help Desk integrations. Instantly answer customer questions by showing popular & relevant articles from your knowledge base, significantly reducing tickets. Any unresolved issues and offline messages are converted into tickets with the use of ProProfs Help Desk to ensure they are never missed and get a timely response. All products work seamlessly together to offer a complete support solution. No HTML or CSS required. Just copy and paste the code. Operators can access chat panel through smartphones, tablets, or laptops anytime. Respond to frequently asked questions faster with canned responses. Brand your chat window with company logo and customize fonts, colors, and more. Understand customer needs and support operator’s performance with insightful reports. Encrypted messages that are hosted on IBM Server. ProProfs Live chat software offers integrations with standard tools such as Salesforce, Zoho, MS Dynamics, Infusionsoft, and so on. Capture leads and close more deals while monitoring website visitors’ activities in real time. 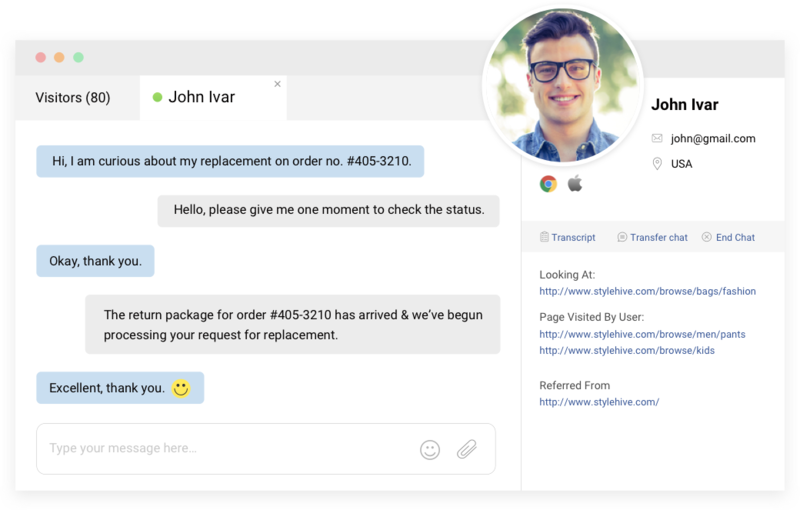 Analyze chat transcripts with reports to deliver delightful customer service. Capture, assemble, nurture, and convert leads into buyers with MS Dynamics integration. Share and transfer information directly to your Salesforce dashboard to better manage your sales and support workflow. Generate leads by capturing visitors’ information and turn chat transcripts into support tickets. Provide personalized and delightful customer service using live chat software. Capture more leads and convert them instantly to sales via live chat. Engage and resolve visitor queries at your eCommerce website with online chat software.